Appeared in Air Force Common Admission Test (AFCAT) and want to know AFCAT marks. Indian Air Force has provision to check the marks scored in its entrance examination online. Read on to know how to check AFCAT marks online. Air Force Common Admission Test is the exam through which applicants are shortlisted for SSB interview testing by Services Selection Boards. As Indian Air Force is providing marks scored in AFCAT examination for all candidates, it is beneficial for all candidates to know their score. Also candidates who have not shortlisted by IAF should check their marks of AFCAT so that they can analyse their performance and improve upon the grey areas. Here is the procedure to check out AFCAT marks scored by a candidate. In order to see score of AFCAT exam, candidate need to go to www.careerairforce.nic.in - official website of Indian Air force. 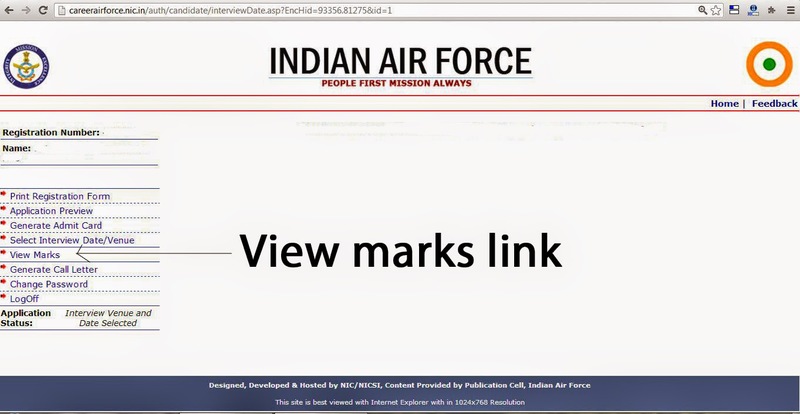 Once the AFCAT marks are available on the website, candidates can see a link "Candidate login" option at right side bottom corner of IAF's website. Click on "Candidate Login" link to proceed to AFCAT login page. Here login with user id i.e., email id provided at registration for AFCAT exam and password. You will be redirected to AFCAT information page on successful login. After successful login, all candidates can see a link "View Marks" link. Click on "View Marks" link to view the marks secured in AFCAT examination. That's all friends. Do share your AFCAT marks here in comments. let us see who have scored highest marks in AFCAT exam this time.